A high-profile city councilman will face two opponents, both newcomers to politics, on Feb. 12 in a race for the Norman Ward 7 seat. Incumbent Stephen Tyler Holman was re-elected to a third term in 2017, months before his acquittal on charges of acquiring proceeds from drug activity. 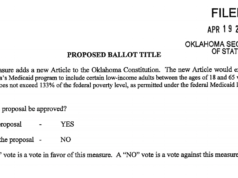 Holman and his employer were charged for operating a store which sold glass pipes, and Holman’s popularity grew when he alleged the charges were retaliation by the Norman Police Department for his public stances against civil asset forfeiture. Now, Holman faces challenges from Kyle Hurley, a business developer and healthcare system manager at Norman Regional Hospital, and Kimberly Blodgett, a teacher in Norman Public Schools and an education activist. Norman voters will also choose new City Council representatives in Wards 1, 3, and 5. Ward 7 contains the south part of OU’s campus, including the research campus and extends south past State Highway 9. Experience: Holman is the Norman Ward 7 incumbent and has been a member of the City Council since 2013. Holman has also served on the 2010 Complete Count Census Committee, Norman 2060 Strategic Water Supply Committee, Animal Welfare Oversight Committee, and Center City Visioning Committee. Platform: Holman said he wants to focus more on Norman’s water, the source of study in recent years for its high levels of chromium-6, and creating a more open government. “I believe a truly transparent civic process requires citizen oversight and involvement. Ward meetings, social media outreach, improved functionality of the City website and development of mobile app for residents,” according to his website. He would also like focus on city growth, public safety, and the transportation network. Experience: Hurley has been a medical provider, business developer, and manager for the Norman Regional Health System spanning a 19 year period. He also served on the Board of Directors for the American Red Cross for three years, and is the current Vice President of the Norman Rotary club. Experience: This is Blodgett’s first political race, but she has worked in hospitals, nursing homes and schools. According to her Facebook page, she “acted as leader for my school site and coordinated daily schedules to ensure our voices were heard at the Capitol” during the April teacher walkout. Platform: Blodgett supports the completion of the senior center in Norman and infrastructure modernization throughout the city. Public safety is one of Blodgett’s top priorities. “As a teacher for Norman Public Schools, the children of Norman and their families are a top priority for me and it’s important to me to ensure they are for the council as well,” according to her website.